5" correction or spoon mouth high port curb bit with fancy notched 8 1/4” shanks that have an etched concho surrounded by metal dots on each side, & fancy slobber bar with rein rings. Great show bit. Brand unknown. 5" medium port correction bit with sweet iron or black steel mouth piece, stainless port, & 7” shanks. Port height is 1 3/4". A well balanced bit with a no pinch connection, & medium plus leverage. The mouthpiece adds tongue pressure for a better headset & the 3 piece action applies more pressure to the outside of the bars for more control. The port connection is smooth & will not pinch. 5" black steel or sweet iron mouthpiece with copper inlay, copper port correction mouth, & black steel overlay on 8” shanks. Brand unknown. Normal light rust on untreated black steel parts. Designed for a horse that tries to lip a bit. This bit has good leverage for control, & the swivel to enhance lateral control. This mouthpiece adds stability to the shoulders. The copper roller works as a pacifier for a nervous horse & adds tongue pressure to help break a horse over at the poll for better headset. 5" sweet iron mouthpiece with 1/2" medium port & copper roller, & 8 1/2" loose "seven" shanks. 5” medium to high port curb mouthpiece with 9” shanks. Nickel/brass alloy similar to vintage Never Rust bits. Use on Walking horses, Gaited breeds or really hard mouthed horses. Lots of leverage with these shanks. Brand unknown. Correction bit with 5” copper mouth, stainless steel swivel port that is approx 1 1/2” from top of port to bottom of mouthpiece, & almost 8” shanks. For the experienced horse & rider as this bit has strong effect. 5” black steel or sweet iron medium high port mouthpiece, & 7" braided rope design slightly turned back shanks. Untreated sweet iron/black steel mouthpiece will rust with use as it is designed to do, but some horses prefer the taste & it promotes a moist mouth. Mouthpiece is a 4 3/4" or tight 5" with 7" braided rope design slightly turned back shanks. New but was tried on horse for fit once. The Billy Allen style bit is named for the legendary horseman. The roller acts as a pacifier for the anxious colt. 5" high port mouthpiece with a 3/4” long copper roller cricket, & 8 1/2" loose cheeks or shanks. Comes with connector bar. Odd bit that is a blend of steel & cast aluminum. 5" straight bar steel mouthpiece with steel spoon or spade raising up 2 1/4" from top of mouthpiece bar with copper wrapped sides & copper or brass roller center that has raised ridges & rolls freely. Shanks are 8" cast aluminum with a heart cutout & is etched or engraved. Shaped connector bar at bottom is also aluminum with etched or engraved detail. Holes at ends of shanks are for loose rein rings, which are missing. Bit is slightly twisted as it doesn't sit on a level surface, meaning 1 shank is out of plumb by about 1/4", rein rings are missing & connector bar is missing part of it's engraved surface from corrosion. Possibly an old Don Ricardo, Crockett, or Renalde bit, but can't find any maker's mark due to corrosion inside shanks. Still a usable bit if rein rings are added, or add to your bit collection. We feel this was a custom made bit due to the odd blending of materials, & we have never seen one quite like it. Great oddity piece. Selling this in AS IS condition. 4 3/4” high port or spoon mouthpiece with copper inlay & 8 1/2” slightly turned back shanks. The spoon high port is not only a good everyday working bit, it is also a gentle bit, & an effective tool when you need to advance the horse's ability to give his chin and frame his body. The long shanks work well with older, more experienced horses. Sweet iron keeps the mouth wet and responsive. Black steel or sweet iron is untreated so it is rusty, but some horses prefer the taste. Good used condition with some rust. 4 3/4" or tight 5” sweet iron high port mouthpiece with copper wrapped bars, & 8” shanks. Top of shank/purchase is bent outward to allow for cheeks without rubbing. Sweet iron is untreated black steel that is meant to keep the mouth moist as it rusts, & copper wrapped bars give a bit more texture while producing salivation & is great for horses who tend to lean on the bit. Brand unknown, but there is a mark or initials stamped into the port(see photo), so this may have been a custom made bit. Possibly D D which stands for Daryl Davis, a custom bit maker. 5” sweet iron high port spoon mouthpiece with copper roller, copper inlays, & 7 1/2" turned back shanks with rope connector. C style bit is black steel or sweet iron which is untreated so there is rust which is customary & promotes a soft, moist mouth. Copper roller calms the nervous horse while also promoting a moist mouth. 5" 3 pc stainless steel mouthpiece with balanced double hinged high copper port & 7” slightly turned back loose shanks. Port is approx 2 3/8" wide & 2" high from bottom of mouthpiece to top of port. The 3 piece loose jaw design allows every aspect of the horse to be controlled at once or each side can be lifted & controlled independently. The high port contacts the palate while pressure on the tongue & bars adds authority, while the copper promotes a moist responsive mouth. From green to finished, this bit has tremendous application. Some chew marks on copper port but they are mostly smooth & nothing that should bother the horse. 5” 3 pc black steel overlay on stainless steel mouthpiece with copper inlays & has a balanced double hinged high black steel port with 7 1/4” slightly turned back Loomis style shanks. The correction mouth has a high port that works off the roof of the mouth while bar and tongue pressure adds authority. Copper bars, along with the black steel or sweet iron, keep the mouth wet and responsive. 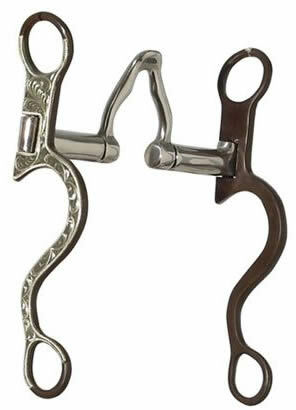 This training bit has both shank and D's for multiple reins in various training applications. The correction mouth is one of the most popular mouthpieces in use today. The 3 piece loose jaw design allows every aspect of the horse to be controlled at once or each side can be lifted and controlled independently. From green to finished, this bit has tremendous application. New but was tried on horse 1 time, so untreated black steel/sweet iron port has a few tiny spots of rust on the inside of port. 4 3/4” mouthpiece with copper roller or cricket, copper coated hood or spade, & 9 1/4” shanks. West Coast style shanks feature a high cheek to shank ratio that reduces signal and demands an immediate response. The spade mouth has a copper shield & roller that keeps the mouth wet & responsive. 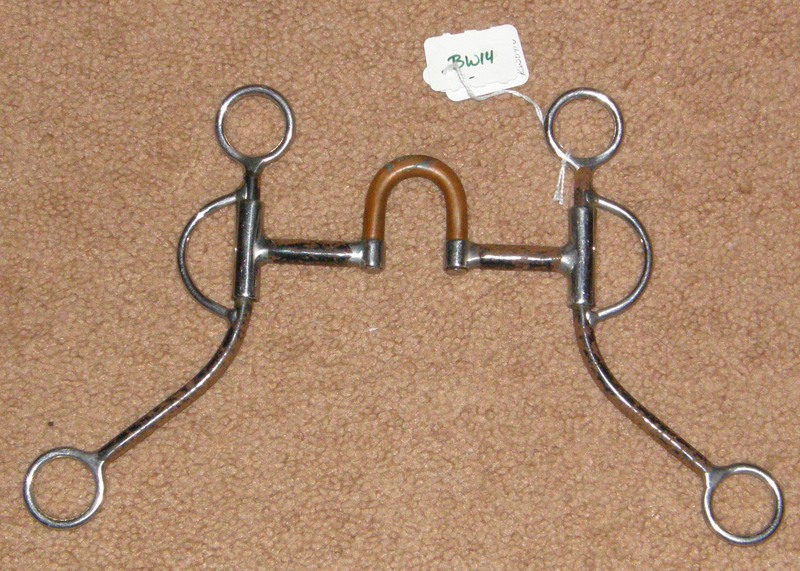 Shanks have slots for snaffle or direct rein, & holes for slobber bar. Good used condition but has rust pitting on mouthpiece & shanks. Looks like an older Change-A-Bit, which allowed you to change mouthpieces, but cheeks have rivets, not anything removable. Vintage bit, still very usable or add to your collection. 5” 3 pc black steel overlay on stainless steel mouthpiece with balanced double hinged high copper port with 8 1/4” slightly turned back Loomis style shanks. The correction mouth has a high port that works off the roof of the mouth while bar & tongue pressure adds authority. Copper port, along with the black steel or sweet iron, keep the mouth wet & responsive. This training bit has both shanks & D's for multiple reins in various training applications. The correction mouth is one of the most popular mouthpieces in use today. The 3 piece loose jaw design allows every aspect of the horse to be controlled at once or each side can be lifted and controlled independently. From green to finished, this bit has tremendous application. Some chew marks on copper port & untreated black steel mouthpiece has minor rust as intended. Black steel western show bit with tight 5" sweet iron high port swivel correction mouthpiece with copper inlay, 8 1/2" shanks with beautiful large engraved silver concho at mouthpiece. Port measures 2" from bottom of mouthpiece & shanks swivel. Black steel or sweet iron is untreated steel so will rust, as it is intended to do, as it promotes a moist responsive mouth. Used once to show a horse, so looks like new except for a few light scratches on mouthpiece & a few small spots of rust inside a bridle ring. Brand unknown. 4 3/4” or very tight 5” medium port stainless steel mouthpiece with 7 3/4” engraved silver(German or Sterling) shanks, not counting the rein rings. This is not an overlay on the shanks, the shanks themselves & connector bar are silver with engraving & have a large fancy concho at mouthpiece. Shanks, conchos & engraved slobber bar all have a brassy tinge to them similar to the look of a Never Rust nickel alloy bit. Copper brads hold 3” diameter conchos on stainless discs, with 1 copper brad missing & replaced with a stainless one. Bit is unmarked, with no maker marks that we can find. Owner says this bit is over 30 years old & was used to show Arabs & thinks it is an old Billy Royal. Bit is shown with older silver patina so is not cleaned, but should clean up very nicely. Great show bit, this was a very pricey bit when new. 5" high port correction mouthpiece with spring loaded 2 1/2" spade port & 8" cheeks. 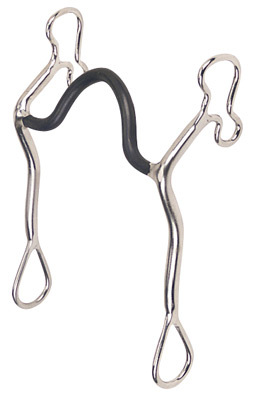 Revolutionary new bit design eliminates pinching of cheeks & tongues, reducing tension & stress. Mouth stays closed & calm, so horses are able to concentrate on learning. Internal bushing permits either half of the bit to rotate independently of the other. Each side of the horse can be worked separately as in lifting a shoulder & flexing exercises. Engraved silver overlay on polished Sweet Iron which naturally oxidizes or rusts. Like new condition with only minor rust/pitting on backs of shanks. Bit was on display in a cabinet more than it was on a horse. Vintage Sliester Bit 5” Correction Mouth Copper Roller Bit Polo Mouth Curb Bit Copper Cricket Western Curb Bit Prototype One of a Kind Bit? Vintage curb bit with 5” nickel mouthpiece, rounded port correction mouth with copper barrel roller or cricket, almost 8 1/4” shanks with out-raised studs or spots, C shaped cut out, free hanging swivel rein rings & connector bar that has Sliester-Bit stamped on it. Odd mix of metals- nickel mouthpiece, looks like chrome plated shanks, & slobber or connector bar looks like stainless steel. Rein rings are rusty, minor flaking or pitting on shanks. Looks like the word Barrel stamped onto back of the connector bar. This is a heavy bit, with most of the weight in the mouthpiece itself. Great to teach a horse to keep its head down. Use this interesting bit or add to your collection. Notes we got from the current owners of Sliester Bit company regarding this bit. "Very cool bit. We bought this company in 1979 from the two brothers that started it in 1954. We have never had that bit in our line. I do have a few pieces left around, but that is the first one I have seen together, with the cheek piece chrome plated and the mouth is a polo mouth sand cast nickel. That bit may have started with a company called Result.” Since owner has not seen this combination of metals used on 1 bit, it may have been a prototype or 1 of a kind. 5” high port mouthpiece with 7” C or swept back shanks with a butterfly & scrolling design etched on shanks. Looks like top of shanks were heated to bend the bridle rings away from the horses face(see close up of butterfly design photo). This does not hurt the bit, just has a sooty look to the area from heat used to bend metal. Brand unknown. 5” 3 pc black steel mouthpiece with copper inlays & has a balanced double hinged high black steel port approx 2 1/2", with 8 3/8” slightly turned back Loomis style shanks. The correction mouth has a high port that works off the roof of the mouth while bar and tongue pressure adds authority. Copper inlaid bars, along with the black steel or sweet iron, keep the mouth wet and responsive. 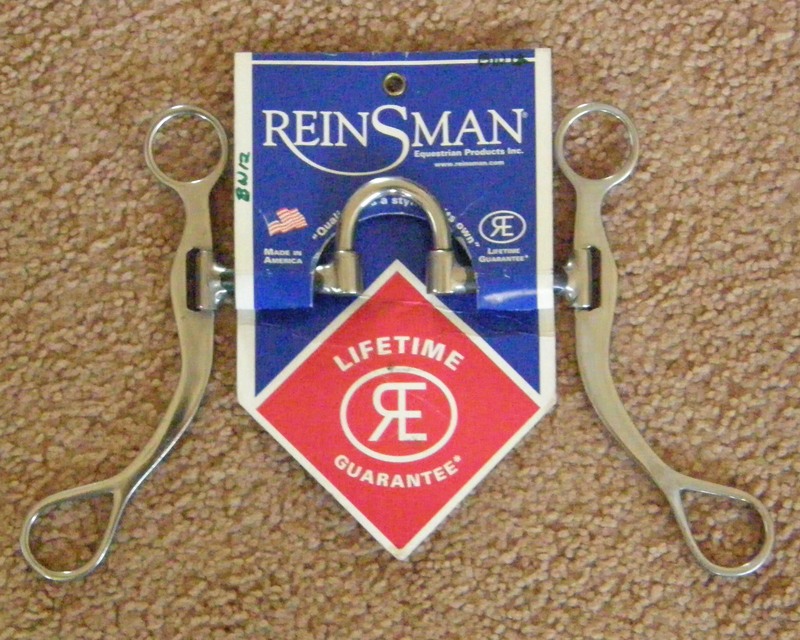 This training bit has both shanks & D's for multiple reins in various training applications. The correction mouth is one of the most popular mouthpieces in use today. The 3 piece loose jaw design allows every aspect of the horse to be controlled at once or each side can be lifted and controlled independently. From green to finished, this bit has tremendous application. Untreated black steel or sweet iron rusts as some horses prefer the taste & keeps the mouth moist. No maker mark so brand unknown. Has a handmade look to it since the welds are not as finished as mass produced. 1 weld was rough at mouthpiece/port joint so was filed to smoothen & can be seen in photo as a shiny spot. 5” sweet iron high port curb bit with port that is approx 2” from top of port to bottom of mouthpiece, & almost 8” shanks. Top loops for headstall/curb chain are bent outward to give more room for horses cheeks/jaw. Similar to a Whoa Maker bit, but port is rounded not V shaped. For the experienced horse & rider as this bit has strong effect & provides some whoa. Some rust to untreated steel mouthpiece as it is designed to do, as it promotes a moist, responsive mouth. Brand unknown, possibly KMSS. 3 pc stainless steel mouthpiece with balanced double hinged high copper port & 7” slightly turned back loose shanks. Mouthpiece measures 4 3/4" or a tight 5". Port is approx 2" wide & 2" high from bottom of mouthpiece to top of port. The 3 piece loose jaw design allows every aspect of the horse to be controlled at once or each side can be lifted & controlled independently. The high port contacts the palate while pressure on the tongue & bars adds authority, while the copper promotes a moist responsive mouth. From green to finished, this bit has tremendous application. Some chew marks on copper port but they are smooth, not rough. 5" 3 pc stainless steel mouthpiece with balanced double hinged high copper port & 7” slightly turned back loose shanks. The 3 piece loose jaw design allows every aspect of the horse to be controlled at once or each side can be lifted & controlled independently. The high port contacts the palate while pressure on the tongue & bars adds authority, while the copper promotes a moist responsive mouth. From green to finished, this bit has tremendous application. Some chew marks on copper port but they are smooth, not rough. 5" sweet iron or untreated steel mouthpiece with approx 2" high port & 8 1/4" shanks. High port offers complete tongue relief. A great bit that will make a horse flex at the poll with contact. Similar to a Whoa Maker bit, but port is rounded not V shaped. For the experienced horse & rider as this bit has strong effect & provides some whoa. Untreated steel mouthpiece promotes a moist, responsive mouth. 5” sweet iron medium to high port mouthpiece with 7 3/8" Antique Brown steel shanks that swivel & have engraved silver overlay. S, cavalry or futurity style bit entirely in black steel which is untreated so there is rust which is customary & promotes a soft, moist mouth. Port is approx 1 1/4" high. Maker or brand unknown. Black steel western curb bit with 5" sweet iron swivel high port mouthpiece with copper inlay, & 8 3/8" swept back Foreman style shanks. 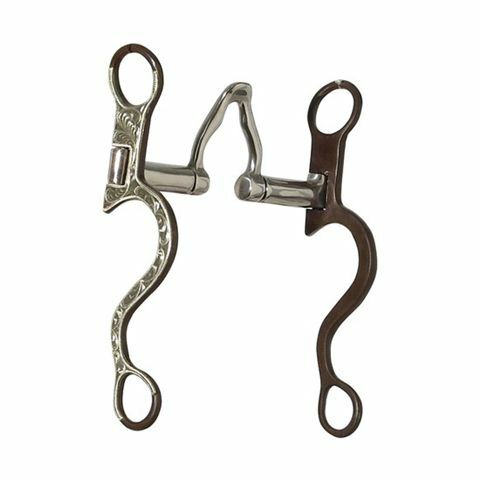 This makes a great transition or training bit as rings on shanks offer various rein placement options, large ring for a direct rein or bottom ring for a leverage action. Port measures 2 3/8" from bottom of mouthpiece & shanks swivel. Black steel or sweet iron is untreated steel so will rust, as it is intended to do, as it promotes a moist responsive mouth. Mouthpiece & shanks are rusty as intended. Brand unknown, possibly custom made. 4 3/4" or tight 5" high or correction port mouthpiece with copper roller, & 7 3/4" turned back shanks. 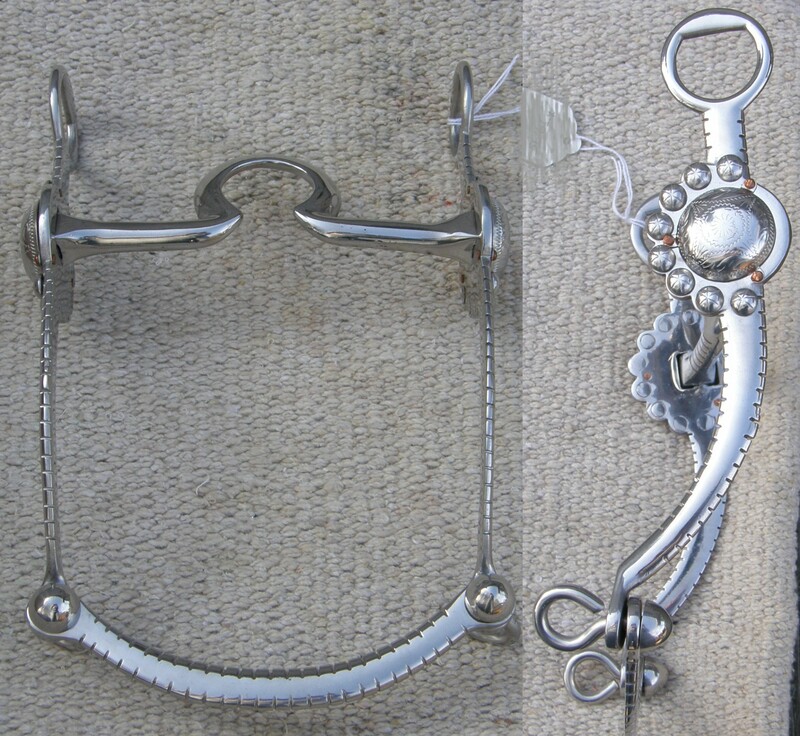 A heavy weighted curb bit, great for western pleasure horses, as it encourages them to keep their head down. Brand unknown. Size- 4 3/4" - 5"